Joseph Stalin (18 December 1878 - 5 March 1953) Stalin was absolute ruler of the Soviet Union from 1924 until his death in 1953. 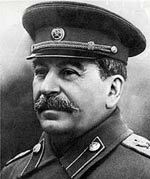 Stalin presided over the industrialisation of the Soviet economy and was the supreme war leader during the Second World War. In consolidating his absolute power, he ordered many ‘purges’ in which people in positions of power were executed or sent to gulags. Stalin was also instrumental in the formation of the Cold War and annexation of Eastern European countries after the end of WWII. Stalin was born, Ioseb Besarionis dze Jughashvili, on 18 December 1878 but later adopted the name of Stalin – which in Russia means man of steel. In his early life, he only gained a rudimentary education and was drawn towards Communist ideology and became involved in robberies and violence against Tsarist sympathisers. Stalin was captured and sent to Siberia, but he managed to escape. In 1917, Stalin played a key role in the Russian revolution; he gained control over the party newspaper Pravda and helped Lenin to escape to Finland. Stalin was one of the five-member politburos whom Lenin appointed in the Russian civil war against anti-Bolshevik forces. During the early days of the Russian Revolution, Stalin frequently clashed with Leon Trotsky and Stalin advocated harsh measures to ensure discipline and loyalty. In 1922, Lenin fell ill and Stalin became one of the main links between Lenin and the outside world. Lenin became increasingly distrustful of Stalin, disliking his arrogance and love of power. In Lenin’s testimony, he wanted Stalin removed from power. However, with great skill Stalin formed an alliance’s with other key Communist party members, He outmanoeuvred Trotsky and had him expelled from the Soviet Union. On the death of Lenin, Stalin was able to assume the position as leader of the Soviet Union. He quickly strove to consolidate his power removing anyone he suspected of being disloyal. In the 1930s, he unleashed a great wave of purges which led to the capture, torture and execution of many prominent members of the party, army and society. These purges went far beyond suspected disloyal members but became increasingly random – as if to strike fear into the heart of anyone in society. In light of revelations from the Soviet archives, historians now estimate that nearly 700,000 people (353,074 in 1937 and 328,612 in 1938) died during these purges. In 1939, Stalin shocked the world with the signing of the Nazi-Soviet pact which agreed on non-aggression with Germany, and also in secret agreed to carve up Poland. When Germany attacked Poland on 1st September 1939, the Soviet Union also attacked in the East. When Stalin was warned of an impending invasion by Nazi Germany in 1941, Stalin couldn’t believe that Adolf Hitler would attack the Soviet Union. When German forces streamed over the border, the Soviet Union was almost defenceless and German forces swept through the country reaching almost the outskirts of Moscow by 1942. However, at Stalingrad, the tide of battle was turned and slowly Russian forces pushed back the Germans beginning the long push back into Germany. 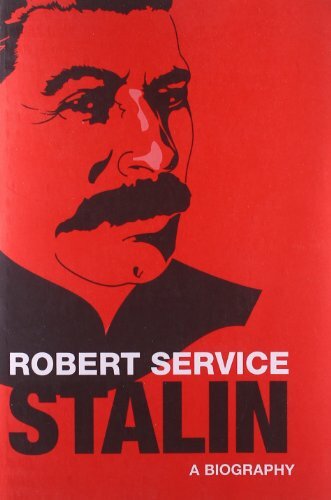 Stalin took close command of the war and went to great lengths to portray himself as the heroic war leader. He was ruthless as Supreme military commander, often having Generals shot if they lost a battle. He also made armies dig in and refuse to retreat. However, with great loss of life, the Soviet Union were finally able to prevail. When the German army was at the gates of Moscow in 1942, Stalin refused to leave, and his presence in the city helped to maintain hope. The Germany occupation of Western Soviet Union was brutal with millions being killed by the occupying forces. As the Russian army liberated their own country and saw numerous accounts of atrocities, they, in turn, committed atrocities in their conquest of Germany. Even Soviet citizens who survived the German occupation were often arrested and deported on Stalin’s orders. He believed that many in the occupied zone had collaborated with the Germans. After the end of the Second World War, Stalin became desperate to get the nuclear bomb, after seeing its devastating effects in Japan. This became more important as the end of the Second World War gave way to the Cold War between the US and Soviet Block. Stalin was instrumental in creating the Eastern Block and Warsaw Pact – denying Eastern European countries the opportunity to pursue democratic self-government. Stalin died in 1953 after suffering a stroke. Perhaps no other person has been so committed and so successful in achieving total power and control. Stalin was paranoid and power hungry – ruthlessly ordering the murder of millions of his own subjects on the slightest pretext of disloyalty or even threat of disloyalty. Yet, despite being utterly ruthless and vindictive against his own population, Stalin was viewed as a great war leader, who heroically stood up to the advancing Nazi war machine – Stalin is credited with overseeing the successful defence of the Soviet Union and later the advance into Germany and complete defeat of Hitler’s Germany. His death in 1953 was mourned by millions who saw Stalin as a champion of Communism and hero of the Second World War. But, even the next Russian Premier – Nikita Khrushchev, later went onto denounce the ‘cult of personality’ that surrounded Joesph Stalin. Citation: Pettinger, Tejvan. “Biography of Stalin”, Oxford, UK. www.biographyonline.net 23rd May 2010. Last updated 8 February 2018. People of the Cold War (1948-1990) Famous people who participated in the Cold War between the Soviet bloc and the U.S. / Nato allies.